Dilger-Maxwell Agency announces a collaboration with nonprofit Let’s Get Real in Vermillion, OH, to support the needs of people battling addiction. The latest campaign in the agency’s ongoing community involvement program plans to direct raised funds to help provide vital counseling to help addicted individuals reclaim their health and their lives. ...it’s heartwarming to see the support found at Let’s Get Real. We feel honored to aid their mission to help those fighting addiction reclaim their lives so that they may become healthy, productive, contributing members of our community. Dilger-Maxwell Agency has unveiled a new charity campaign in their ongoing community enrichment program serving families of Vermillion, Norwalk and areas west of Cleveland. Let’s Get Real is a nonprofit organization which focuses on counseling for people on the journey of battling addiction to reclaim their lives. Compassionate community members who wish to join the initiative to assist area residents with their recovery may now do so at: https://www.crowdrise.com/lets-get-real-in-the-journey-to-recovery. Let’s Get Real was established just three years ago in response to a growing heroin epidemic. Believing ‘substance doesn’t matter, recovery does’ Let’s Get Real assists in recovery for any and all addictions. 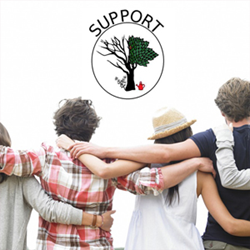 Their goal is to fill in the gaps in service for both the addict and their family members with a caring staff of coaches, made up largely of volunteers with a desire to give back to the community, who have personal and/or professional experience in addiction. Let’s Get Real is a Recovery Community Organization which works collaboratively with existing community organizations with similar missions. They heavily rely on private donations. Utilizing its own resources and seeking the help of its vast network of customers and business partners, Dilger-Maxwell marches on to ensure customers, friends, family and neighbors are always in good hands. Social media and an email awareness campaign will be used to help the agency’s caring team to spread the word about the campaign for Let’s Get Real. They have also featured the cause in their monthly magazine, Our Hometown, which is delivered to thousands of households in Vermillion, Norwalk, and surrounding communities. The electronic Flipbook version of the current issue may be viewed here: http://www.dilgermaxwellagency.com/Our-Hometown-Magazine_46. Supporting their latest Community Cause has never been easier, as Dilger-Maxwell has pledged to donate $10 to Let’s Get Real for each and every recommendation they receive for an insurance quote, with no purchase necessary. Readers who would like to view the campaign, recommend friends and/or make a personal donation may do so here: http://www.dilgermaxwellagency.com/The-Real-Journey-Toward-Recovery_9_community_cause. The agency recently launched their master charity program, promising to choose a new local organization, family or person every two months to receive support. To learn about past initiatives, please visit: http://www.dilgermaxwellagency.com/community-cause. Further information about Dilger-Maxwell Agency and Let’s Get Real are available at http://www.dilgermaxwellagency.com/ and http://letsgetrealinc.ieasysite.com/. An award-winning, full service insurance firm serving families from offices in Norwalk and Vermillion, OH, Dilger-Maxwell is committed to bringing local people an agency which understands their needs. Tonia Maxwell and her team of dedicated professionals work with carriers to assemble a variety of products and services which will ensure their clients’ peace of mind. From all of the products a typical consumer needs (home, auto, boat, ATV, etc. ), to financial planning services, Dilger-Maxwell delivers consistently superior service. Their caring experts may be reached by calling 419-668-8016 (Norwalk) or 440-822-3512 (Vermillion).